I recently got my Raspberry Pi, a cheap single board Linux computer designed for education and hacking. I already have OLPC laptops and Arduinos as hackable places, but it looked like fun. Now I have it I can assess it as a learning tool in home and school contexts. Compare that with another Linux computer designed for educational hacking, the OLPC laptop at $188 or more realistically $200+ with freight. Consider an old unused PC or laptop as a hacking platform. 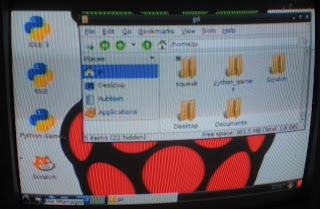 Writing the OS, Raspian (Debian) Wheezy, to the memory card was easy, once I really read the instructions. I used the Linux method to setup the card using dd an OLPC XO laptop, I did have to use another computer to unzip the 1.9GB OS when it failed on the XO. Not having a hi definition TV I used composite video (the yellow plug). I was disappointed with the screen resolution. Its presumably quite good on a hi def tv. 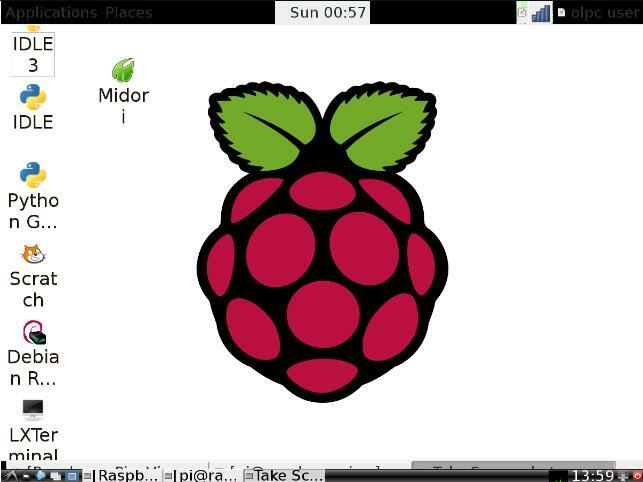 Next step was to run the Raspberry Pi remotely from an OLPC laptop using ssh. 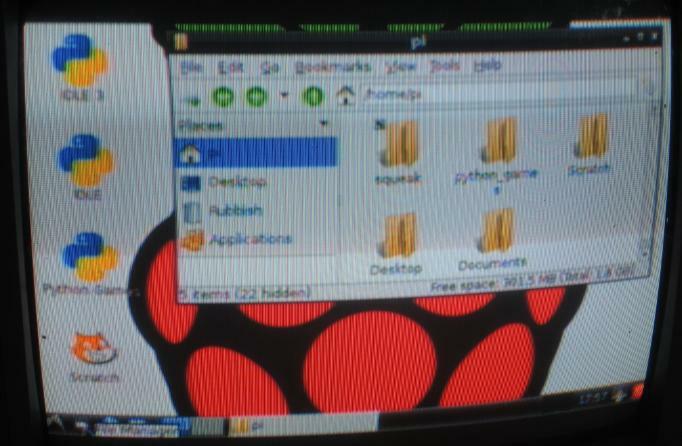 That brings up the Raspberry PI command line interface on the XO. You can run xwindow programs, they display using the XO's window manager. Though startx does not start the Pi desktop but startlxde gives some success. 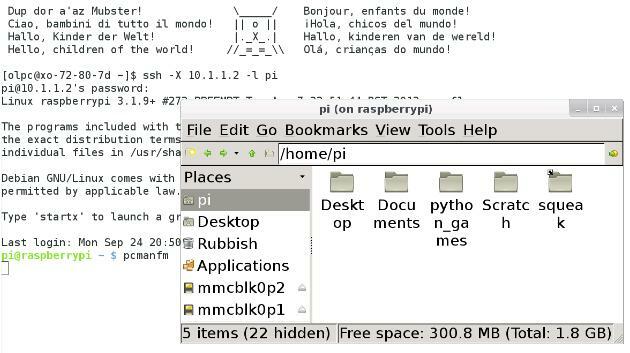 In Sugar, the desktop is always hidden but the bottom menu bar is available. 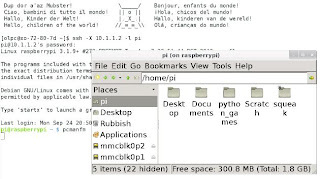 Using OLPC build 3 13.1.0 in Gnome, the Pi's desktop is visible, possibly due to a bug where the XO's Gnome desktop is not displayed. So why use the Pi at home or school? School is unlikely to have a class set of TV's or space for them. Home is unlikely to have the USB keyboard, power supply and cables. But both school and home are likely to have older underpowered PC's or laptops (which can be reimaged to Linux if desired) and used as hacking platforms. Those with OLPC laptops have a computer, purpose designed for hacking. The Pi does provide an additional hacking platform, having multiple platforms is a good thing, not all tasks 'click' or work for all learners. The Pi can be used as an I/O board like the Arduino. Unfortunately its I/O pins are not protected and can be damaged by 0V (27mA) or voltage >3.3V. Compare with the Arduino I/O which can source up to 20mA to ground and be connected to 5V.